Let’s get the vinyl-over-windows frustration out of the way first. It’s never a good idea to ask the public to vote on branding; it’s bad enough letting them decide on EU membership or naming a research vessel for the British Antarctic Survey so when CT Plus Jersey (an HCT Group company) celebrated winning the contract to replace Connex to run the State of Jersey’s bus network in January 2013 and invited the public to vote on the marketing and branding for the revitalised network as a bit of a ‘community involvement’ PR stunt, it was bound to offer up a Boaty McBoatface result. Sails are all very well, but whoever thought it was a good idea to cover bus windows with them has obviously never travelled on a bus, especially on an island renowned for its spectacular views across glorious bays. The fact the public backed livery went on to win an award for ‘Best Brand Campaign’ at the ‘Jersey Chartered Institute of Marketing Awards’ in 2013 speaks volumes about such dubious accolades rather than anything to crow about. Six years on from winning the contract it was telling to see what seems like the majority of buses looking distinctly slapdash with missing vinyl where panels have been replaced during my whistle-stop visit to Jersey this Easter weekend…..
….. but there’s a glimmer of hope for the future as it appears the designers have finally seen sense, with a year left to run on CT Plus’s initial contract and introduced a very welcome modified livery with less prominent sails which I spotted on a few newer or repainted buses. So, having sorted that, here are some of the many positives about LibertyBus. It’s a tidy, easy to understand network with all bus routes sensibly radiating out from St Helier which lies a little to the east of the centre of the south coast, and is the Island’s capital. Pretty much all the main tourist hot spots and coastal bays are served by bus meaning there’s no need for tourists to hire a car, although many must do as this rather effective and poignant message on a bus confirmed. For those eschewing car hire, three bus routes serve Jersey Airport, located in the west of the Island, with buses stopping right outside the exit to the terminal building. Most routes run to an hourly frequency with route 15 to the Airport and route 1 to Gorey Pier, on the east coast, running every 15 minutes Mondays to Saturdays and every 20 minutes on Sundays. Route 3 to Jersey Zoo is increased to half hourly from the end of May to the end of September when there are a few other seasonal enhancements to the network. Most routes are operated with single decks (Solos, both long and short, dominate the fleet) but route 15 as well as route 22 to the west coast are double deck (Alexander Dennis Enviro400s and a few ex London Scania OmniCity buses). Buses were busy as you’d expect over a late Easter weekend with superb weather but the frequencies and vehicle capacities seemed to be coping well. I saw one or two ‘stacked out’ Solos on route 12A which skirts St Aubin’s Bay on its way to the picturesque St Brelade’s Bay and Corbière on the south coast. On Sunday buses were leaving Liberation Station showing ‘Sorry! Bus Full’. I reckon the ‘high summer’ seasonal route 12 could usefully be added to the network from Easter. Summer only route 14 which follows a similar route to the 12A as far as St Brelade’s Bay has a Beach Bus branded open topper (a second hand Dennis Trident from Lothian) and was doing a good trade for much of the day although I noticed it had been replaced by a standard closed top double deck later on. It was noticeable how many families and people of all different ages were travelling by bus, and although there was some minor late running due to squeezing pass traffic on narrow roads, there was no real congestion issues and it was all the more enjoyable to travel around the Island without incurring severe Bank Holiday traffic delays. I was particularly struck by how few sets of traffic lights I encountered on my travels. LibertyBus have a unique system for marking bus stops; in many cases there’s no pole on the pavement but simply the word BUS painted on the road with a four digit number (which appear to be to any random sequence along a route) to identify the stop to find live departure times online, although the look up option also includes bus stops by name too. I wasn’t convinced all the information was showing ‘real time’ either. The most odd feature is the listing of routes online which, like the bus stop numbering, also appears to be in a strange random order. I guess locals get used to it though. There’s a very impressive zoomable colour coded online map which shows the exact position of every bus on each route by colour as well as every bus stop being clickable for departure times and interestingly this sits on a Government of Jersey webpage rather than the LibertyBus website. Slightly less impressive, the online network route map which backs up the ‘journey planning’ tool is out of date showing a route (27) and network link (route 4 to the Zoo) which are now withdrawn. The website also contains an image of the very colourful and helpful network timetable book which one can scroll through, but frustratingly as the timetable pages are printed landscape you have to crick your neck to try and see them at ninety degrees on screen. It would help if a pdf of the timetable pages in the book could be shown turned by ninety degrees or more pertinently the website be updated and the timetables which are showing the right way up but expired on 31 March (for the winter), and still displaying, need to be taken down and replaced with the now current summer timetables. There’s no app available which is a shame as these rather cumbersome look up features, including real time departures, lend themselves to be much simplified through using a handy app on a smartphone when out and about. It could also give the option of mobile tickets. The heart of the bus operation is Liberation Station where all services terminate. There’s a Tourist Information desk as well as a LibertyBus Customer Services desk with extensive opening hours. Both have supplies of the timetable book to hand out but I noticed none were on wide display for passengers to help themselves, which is a shame. I did spot a little pile on the Customer Services counter from time to time. There were lots of racks containing plenty of other tourist leaflets including a Visitor Map of the island which I noticed many people using (it does show some bus route numbers but is no good to follow the routes). I also noticed a lack of timetable books on board buses and other distribution points such as hotels; something Stagecoach do very well in the Lake District by comparison. The bus station concourse is extremely well laid out being very inviting and airy as well as functional. There’s a coffee/snack bar and also a Brompton Cycle Hire facility and toilets are adjacent. There are a few seats by each of the ten departure bays on the inner side of the concourse which have doors covered by advertising material so you can’t see into the gloom where the buses draw up. However, there are screens advising of upcoming departures and at each departure bay a screen shows imminent departures. The advertising at most of the bays features a tourist attraction along the route which is a nice touch. Once a bus pulls up ready for boarding the departure door opens. The area hidden from view reminded me of Aylesbury bus station, except there passengers have to wait and board buses in the gloomy area. This side of the bus station can only take single deckers so the double deck operated routes depart from the other side of the concourse on the roadway where there are a further four departure bays and where all evening departures leave when the concourse is closed. Many buses also set down at these stops too. Smartcards are available for regulars, visitors and students on which a range of consecutive day tickets or pay-as-you-go can be added and contactless is also available, but there’s no on board Wi-fi or usb sockets, but there are next stop displays and in some cases, audio too, although I noticed on some routes the displays seem to get stuck. The audio only plays for major tourist destinations. As mentioned earlier, no mobile tickets are available which would prove useful for visitors. Fares and ticket prices are good value. A day ticket at £8 gets cheaper the more consecutive days you buy (2 for £15, 3 for £21 and 7 for £30). A 10p increase was applied to the flat £2.20 fare from the beginning of April but it’s still just £2 per journey for contactless payment or a bargain £1.65 for pay-as-you-go. I spotted the above notice on a bus which would indicate there are cheaper ticket prices for residents who register and use an ‘Avanchi’ smartcard – 7 days travel for £21 instead of £30. If so, CT Plus Jersey are running a risk of a claim for discrimination! …. and thirdly a ride on one of the heritage buses operated by the independent Jersey Bus & Boat Tours to the Jersey War Tunnels; if you’re lucky on the wonderful RTL 326. This tour company runs a number of island tours which are worth considering if you want to explore the island in one journey without taking a myriad of local bus routes. I thoroughly enjoyed my weekend’s wander around the island using routes 1, 1A, 2, 3, 4, 5, 7, 8, 9, 14, 15, 21, 22, 23 and 28 finding well used buses even away from the main tourist spots, keeping pretty much to time, and with very friendly and helpful drivers. The only mishap was the driver on my open top journey on route 14 this afternoon taking a wrong turning instead of heading to St Brelade’s Bay necessitating a 20 minute detour to get back to the same point but it was all taken in good spirit and we all enjoyed a bonus longer journey. CT Plus Jersey’s initial seven year contract expires at the end of this year but I’m sure the optional three year extension will apply; all the signs are that it’s going very well. Passenger numbers have been reported as growing year on year although I noticed this year’s summer timetable has retained a couple of winter features rather than the usual seasonal enhancements. A 9 by 5 mile island would lend itself to electric buses and local press reports indicate environmental issues are rising up the agenda. Certainly something well worth considering. As is a more frequent timetable on the 12/12A with double decks perhaps earlier in the season as well as wider distribution of the timetable book, an app together with mobile ticket options, and add usb and Wi-Fi on board. Sorted. It’s not often a completely new bus route starts up. Usually changes to bus services see variations to long standing routes featuring improvements or reductions to frequencies and journey times or diversions to routes to serve new developments. The last new route launch I can recall was Stagecoach’s brave investment decision to introduce eight new coaches on the South West Falcon branded hourly service between Bristol and Plymouth in 2016. Encouragingly three years on that service seems to be doing very well. There are signs Stagecoach are about to launch another new service in the south east which will be watched with great interest. At the more minor end of the new route investment scale is Brighton & Hove’s brand new 11X which launched today running between Brighton and Eastbourne. Not all along the A259 coast road via Seaford – which has seen remarkable growth over the last twenty years transforming a staid 30-minute frequency service into an amazing 9-bus an hour timetable as far as Seaford with 6-buses continuing to Eastbourne; instead the 11X runs via the less populated inland A27 route where it’s been a struggle to ever make a bus route stack up commercially east of Lewes §Instead of running via Lewes, the 11X route astutely leaves Brighton along the busy Coast Road via Rottingdean, Saltdean, Telscombe and Peacehaven as far as Newhaven before heading inland on the A26 to Beddingham joining the A27 to Polegate and importantly serving Middle Farm and Drusillas Zoo Park along the way before continuing south on the A22 to Eastbourne. It’s a one-bus, three-return-journeys-a-day, Sundays-and-Bank Holidays route for the summer season meaning the commercial risk for Brighton & Hove is minimised. The bus would have sat idle in the garage over the weekend anyway, so the marginal cost is just a couple of drivers’ duties, diesel and other minor incidental expenses. The other great thing about this new route is the idea for it came from Shaun, one of the regular drivers on the Coast Road bus routes, showing a bus company receptive to ideas and suggestions from its employees and prepared to take a punt on trying one out. It’s always nerve wracking to see how a first journey on a new route will work out. Will anyone turn out to take a ride, aside from the devout bus enthusiast keen to record a historic first? The omens were good as I arrived at the Brighton Station departure stop at 8.45am for the 9am journey. There were ten people already waiting. Shaun drove up in the Drusillas branded bus in good time at 8.50am and we left spot on time with twenty on board. As we continued along the seafront to Newhaven we picked more passengers up at all the key stops the ‘limited stop’ timetable observes which, after one passenger alighted at Rottingdean and one in Newhaven, meant we headed to Beddingham and the A27 with a very impressive 56 on board. Now that’s what I call a very successful new bus route inaugural journey. Encouragingly there were many families and children on board; concessionary passes and their poor reimbursement rate were definitely in the minority. Even more impressive, forty passengers alighted at various stops along the A27 including Firle, Middle Farm, Charleston Farmhouse, Wilmington and around half at Drusillas. Until today none of these destinations had been available by bus from Brighton and the Coast Road. As we continued into Eastbourne we picked seven more passengers up at the District Hospital dropping seventeen off in the town centre and the remaining six at the Pier terminus. A glorious sunny and warm Easter weekend has helped kick start this new route but it has all the hallmarks of being a successful addition to Brighton & Hove’s award winning network, and deservedly so. Not only is it tapping into what I believe is a growing market for leisure and tourism orientated journeys by bus – it was noticeable how many passengers alighted with walking maps and other leisure orientated literature – but also full marks to Brighton & Hove for making sure proper promotional leaflets and information is readily available. Bus stops have been updated with the 11X route number and timetable…. …. the real time signs included our departure, on board next stop displays and announcements have all the new stops and there are timetable leaflets on board too, all key ingredients alongside an updated easy to use website with information too. I wish those managers at bus companies who reckon because there’s a timetable online there’s no need to print anything could have seen all the passengers on board this morning clutching the latest edition of Bus Times magazine which was also available on board. This is how you encourage passengers. Arriving in Eastbourne Shaun was understandably well chuffed with a total of 65 passengers having travelled on the very first journey. I reckon this must be something of a record. Ten boarded at Eastbourne Pier for the return journey too. The omens are definitely good. To celebrate it was time for a coffee and soak up the Eastbourne Easter sun and write up this blog. One of London’s best bus routes started up again today for the summer season. Route RP1 runs on Wednesdays from 17th April until the end of October. It runs outside the TfL regime and is completely free to ride thanks to the generous sponsorship of two anonymous (and wealthy) local residents who’ve stepped in to provide continued funding after the three year Lottery grant, that had been funding the route, ran out at the end of last year’s operation. And there’s a brand new bus for this year’s operation. Provided by RAKAT (Richmond and Kingston Accessible Transport) it’s a smart and comfortable 16 seater Mercedes with room for wheelchairs and is used on their community and welfare transport work on other days. The RP1 route comprises a full clockwise circuit around the ten mile internal perimeter road in Richmond Park with bus stops by each entrance/exit including two brief excursions to serve bus stops just outside the Park at Ham Village and Common and Roehampton’s Danebury Avenue. The route also includes a short diversion to Penn Ponds inside the Park as well as the accessible entrance to the Isabella Plantation with its magnificent collection of rhododendrons. There’s also a stop at Pembroke Lodge. It takes just over an hour to do the full circuit. It’s the best hour’s bus ride you’ll ever have in London. I’ve travelled the route at least once each year for a few years now and always thoroughly enjoy the experience. Not least because Malcolm the regular driver makes it so special. Malcolm has been involved in the Royal Parks’ educational trust for many years making sure youngsters get to know all about the amazing features and history of the Park. He’s in his element out and about on Wednesdays driving the bus and providing a fascinating running commentary during the journey not only about the many interesting features you pass by including the famous deer and wildlife but also many historical anecdotes and facts. For example the magnificent tree pictured below is the oldest (circa 800-900 years) in the Park. Every year Malcolm tells me he’s going to retire, but every year to my and other regular passengers delight he’s back for another season, as he was today and on top form too. Whether it be putting out promotional ‘A frames’ at bus stops in Ham …. …. making sure timetables are in place at bus stops all round the circuit …. ….. or delivering supplies of the timetable leaflet to any location that will take them. Malcolm also displays remarkable patience with everyone boarding and alighting including those needing a helping hand and being besieged by families wanting to take a ride into the Park for a school holiday picnic as happened on the second journey this morning. It was also hugely impressive to see TfL come up trumps and inserted this year’s RP1 timetable in the cases at stops in Ham Village and Ham Common so connections with routes 371 and 65 can be promoted. Malcolm was visibly chuffed to see his hard work supported by TfL as was I.
I took a ride on route 430 from right outside Putney station to its terminus in Danebury Avenue from where it’s a short walk to where the RP1 stops on the western side of the ‘cycle only’ barrier which prevents through traffic. There’s a wonderful timetable display here; probably London’s best. Malcolm appeared a few minutes before the first journey’s scheduled departure time of 0940 and another regular passenger (who’d come for the full circuit) and I boarded. We were soon chatting away with Malcolm and were joined by another passenger as we got underway on the circuit picking up two more at Ham Common just outside the Park. Without access to a car and if you don’t cycle (hundreds do cycle around the Park for pleasure) it’s a long old walk to see the delights the Park has to offer so the RP1 is a real godsend. We dropped one passenger off at the Isabella Plantation and another at Pembroke Lodge where we picked up a family of four who were travelling round to Robin Hood gate as well as another passenger boarding for the circuit. We were lucky to see many of the Park’s deer population today basking in the sunshine including a group of red deer crossing in front of us near Sheen Gate. Back at journey’s end at Danebury Avenue the regular passenger and I alighted and left Malcolm to deal with those families off for a picnic. I can’t recommend a ride on the RP1 highly enough. Malcolm is training up another driver to stand in for him on some weeks as well as ensuring he can have a well earned summer holiday this year, but if you do get to ride with Malcolm you’re in for a treat. After that ride I headed over to Hoxton in Islington for a ride on London’s other quirky minibus operated bus route; the long standing 812 which meanders around Islington’s residential roads providing links to the Angel, Clerkenwell and Old Street areas which compliment TfL’s traditional red bus routes. Ironically although the route runs in Islington, it’s operated by HCT Group which has its origins as Hackney Community Transport based in the neighbouring Borough of Hackney but which has grown hugely over the last decade and now has transport interests in many areas of the country. HCT is a social enterprise which reinvests profits from its contract operations (including a growing number of TfL bus routes in London) into non-profit community operations including the 812. HCT’s London operations are now run by a company called CT Plus and the 812 has regular drivers employed by CT Plus who are very attentive to passenger needs and provide extra help as needed. The service provides a circuitous route as can be seen by the green roads on Mike Harris’s excellent London bus map below. Concessionary (‘Freedom’) passes are valid and other passengers pay a nominal £1 flat fare per journey. The timetable has recently changed with an earlier start at 0914 although this journey starts at Skinner Street’s Exmouth Market rather than the terminus at Hoxton where the first departure is a bit later at 0930. 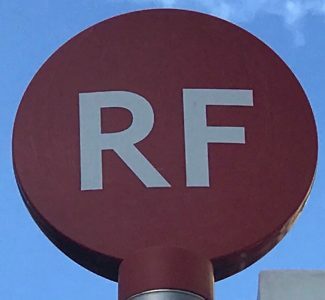 The first two round trips also now have an extended 66 minutes running time to cope with traffic delays but from 1050 the schedule settles down to a half hourly frequency with a fairly tight 57 minutes running time. I arrived at Hoxton just before the 1220 scheduled departure this morning and the smart minibus was already waiting nearby the terminus at Bridport Place; the usual bus stand being blocked by a short turning route 21. We headed off bang on time with one other passenger who mysteriously also travelled all the way around the circuit. Only one other passenger boarded, and she was obviously hugely grateful for not only the service but the extra help provided by our driver as she boarded with her wheelie walking aid. Two buses are needed to run the service and London’s new ULEZ has meant CT Plus have redeployed minibuses from special needs transport work on to the 812 with a refreshed branding and livery. The 14 seat (with room for wheelchairs) Volkswagen minibuses perform well in Islington’s stop-start traffic and provided a very comfortable ride. If you’re in the Clerkenwell, Angel and Hoxton area and have a spare hour during Monday to Friday daytimes outside the peaks it’s worth giving the 812 a ride and see the result of a community transport initiative funded by profits from the big bus routes operated by CT Plus for TfL. An interesting financial model for hard-to-fund routes of this kind. My final foray on London’s non red bus routes was last week after my trip on the Tuesday only 969. Kingston University has been running its bespoke network of bus routes for some years and at the end of 2016 splashed out on a fleet of smart new Wright bodied hybrid buses. Actually it’s RATP-DEV who’ve invested in the buses as they operate the contract to provide the Uni routes alongside their London United bus company which runs an extensive number of contracted routes for TfL in this part of south west London. The three routes KU1, KU2 and KU3 are free to use and aimed at students and staff at the University, but there’s nothing to stop any member of the public hopping aboard (“there is no need to show your University ID”) if the bus is going your way; which it might well do if you travel to and from Kingston town centre from the various University campus sites in Roehampton Vale, Kingston Hill and Penrhyn Road or near the University residential complexes at Seething Wells, Clayhill and Fairfield South. The main inter-site route is the KU1 which runs every 15 minutes (12 minutes in the peaks) from Seething Wells via Kingston town centre to Roehampton. It diverts into the Kingston Hill campus along a magnificent tree lined access road, which is worth a ride just for the majestic splendour of the tallest trees I’ve ever seen on a bus route! The half hourly KU2 is a circular route linking the Halls of Residence at Fairfield and Clayhill with the Penrhyn Road Campus and Surbiton Station, while KU3 is a Monday to Friday four journey per evening amalgam of the KU1 and KU2. The buses are smart and very comfortable to travel in. Heart FM was playing on one ride I took. Unlike many bus routes the average age of passengers is probably around 20. I felt forty years younger after my travels so it was definitely worth a ride … but make sure you know the University’s term dates as there’s no service during holidays. It’s that time of year when local authorities begin a fresh financial twelve months which with dindling Government funding often means less money to spend than the year just ended. For subsidised bus routes that can only mean one thing … another round of cuts and withdrawals. I’ve been out over the last fortnight taking a ride on rural routes facing the axe. Following a public outcry at the scale of proposed cuts to seventy bus routes announced by Kent County Council in November 2017 the local authority embarked on a consultation exercise branded as the ‘Big Convesation’ along with an inevitable ‘Bus Summit’ or two. This led to a very positive outcome with savings in the bus support budget for 2019/20 scalled back from a reported whopping £2.25m to a more modest £455,000. Stagecoach and Go-Coach Hire had made suggestions for sensible economies in the Thanet and Sevenoaks/Edenbridge areas which are being implemented this weekend. I took a ride on the routes and journeys disappearing around Sevenoaks to see what will be missed. Go-Coach Hire operated route 404 is a route of two halves. It connects Edenbridge, Four Elms and Ide Hill to Sevenoaks from the south west with a journey at 0725 (principally for school children) and back again at 1555 as well as a later journey back at 1735 which only continues beyond Four Elms if needed. Secondly it links the villages of Godden Green, Stone Street, Ivy Hatch, Shipbourne, Dunk’s Green and Plaxtol to Sevenoaks from the east also with a school timed journey at 0740 and return at 1526 as well as three off peak journeys for shoppers two of which continue through to Ide Hill to the west of Sevenoaks (on the way towards Edenbridge). There’s a late afternoon journey at 1735 but this only continues beyond Ivy Hatch if needed. The new timetable from next Monday removes the off peak circuit serving Shipbourne, Dunk’s Green and Plaxtol furthest east (but these villages are also served by route 222 operated by Autocar runing north-south between Borough Green and Tonbridge) and reduces the number off peak journeys from three to two as far as Ivy Hatch. However, in a positive development these journeys will continue all the way through to Edenbridge rather than Ide Hill as previously together with an extra new morning journey from Edenbridge as far as Sevenoaks. What’s being taken away from the east, opens up new journey opportunities to the west of Sevenoaks. Yesterday was the penultimate day of the current timetable and I took a ride heading east on the 1415 journey from Sevenoaks to Plaxtol and back again. There were just two passengers besides me. The female passenger got off after a delightful twenty minute ride through Godden Green, Bitchet Common and Bitchet Green at the lovely village of Ivy Hatch while a man took the bus around the soon to be abandoned circular route including Shipbourne, Dunk’s Green and Plaxtol (which was well worth it too, as can be seen in the photgraph below, taken while we waited time at Shipbourne Church) and he alighted at the National Trust property of Ightham Mote, where he had an hour and a half to explore before the bus would take him back on the return journey after the school trip. In the new timetable it’s good to see Ightham Mote (a medieval moated manor house) will still be served by bus with an arrival at 1043 and a departure at 1340. Not that the National Trust will be bothered, as their priority sadly seems to be to attract motorists more than anyone else as the notice on the driveway to Ightham Mote captured below confirmed. We didn’t carry anyone else on the outward journey or anyone coming back into Sevenoaks on the return journey at all, so it’s unlikely this bus is going to be missed by many actual passengers and frankly it makes for a sensible economy. Mind you, when you see the large mansion style exclusive properties we passed on the journey it’s perhaps not surprising – one private road even had a barrier to restrict entry, it was that exclusive! Returning to Sevenoaks, this bus left again at 1526 for its next journey to Plaxtol but with no-one on board although it undoubtedly picks up school children returning home from the nearby academy. The same thing happened on the next journey I took, heading west, the 1555 to Edenbridge, which had been to the nearby Knowle Academy first and picked up 27 school kids going home to Ide Hill, Four Elms and Edenbridge. I was the only non school kid travelling – and it was quite an experience too. On yesterday’s showing of such sparse loadings, rural residents around Sevenoaks are doing well to still be receiving a bus service running each day Monday to Friday, albeit limited in frequency. It’s a shame more journeys can’t be justified, as it really is a lovely rural ride and well worth seeking out if you’re ever in Sevenoaks. Service 405 is a Wednesday only bus route linking West Kingsdown (to the north east of Sevenoaks) and the hamlets of Woodlands and East Hill through Otford to Sevenoaks. Aside from the positioning journeys from and to Sevenoaks which avoid the circuitous routing, there’s just one return journey a week operated by Go-Coach Hire. It leaves West Kingsdown at 0935 arriving in Sevenoaks at 1017 and returns at 1230. It ran for the very last time this week on Wednesday, 3rd April as it’s now been completely withdrawn. I travelled on its penultimate journey last week. The main purpose of the route seems to be to serve the mobile home community, many of whom are of pensionable age, at East Hill Farm which is located at the end of a very long and extremely narrow, winding dead end road. These residents really are isolated and rely on their one Wednesday journey a week to travel into Sevenoaks for shopping. The report to Kent County Council’s Environment and Transport Cabinet Committee meeting on 17th January which approved the withdrawal reckoned “no more than two passengers use it weekly”. When I travelled last week there were twelve regular passengers returning on the 1230 bus (as well as another six taking a final ride like me, just out of interest before the route ends). Seven got off at East Hill who all seemed to be regulars with two others alighting in the Hillingdon Rise residential area in Sevenoaks, exclusively served by the 405, and another in Otford, while two others continued into West Kingsdown. I saw a similar number boarding the journey in Sevenoaks bus station a few weeks ago. I do feel sorry for these people, who’ll now be completely cut off from a bus route to their nearest town. Kent County Council have committed to pilot a “Taxi-bus” as a part replacement for the 405, but this doesn’t seem to be starting until June. No wonder they all had overfull shopping trolleys last week. However, all is not lost as I spotted a notice in the bus shelter in West Kingsdown explaining that Buses4U (a Community Bus Operator) runs a Thursday journey to Bluewater and Gravesend on route 422 but it would seem you have to be a “member” at East Hill to travel, so that rules me out. I’m indebted to fellow 405 passenger and blog reader, Terrence, who told me about the quirky history of route 405, explaining it has its origins in an initiative by Dr H Nesbitt Heffernan who started the Thames Weald Travel Society in the mid 1960s to provide services to villages left isolated when London Transport withdrew routes as well as running a route through the Dartford Tunnel to Romford and one to Crawley for a time. It’s done well to continue for so many years and it will be interesting to see whether the Taxi-bus proves to be a sensible alternative. Kent County Council will save a modest sum from withdrawing the 405 but it’s not clear how much the taxibus initiative will be costing. Go-Coach Hire may generate some extra business by switching resouces on the 404 from the Shipbourne and Plaxtol end of the route for a more regular link between Sevenoaks and Edenbridge which itself is a lovely ride with a great view of Bough Beech Reservoir leaving Ide Hill towards Edenbridge. Finally another positive shout out to Go-Coach Hire for their presentational skills. It was good to see timetables on display in Sevenoaks bus station ready for the new routes and their new numbers (the 404 becomes the 4) starting on Monday and bus stop plates had been updated with new numbers to reflect routes taken over from Arriva. Meanwhile Arriva still don’t know what year we’re in on their website despite being advised …..! As a postscript I also travelled on the aforementioned Autocar operated route 222 between Tonbridge and Borough Green yesterday, and as I tweeted while travelling, was somewhat appalled by the condition of the vehicle. While it was nice to ride this pictureseque route on a double decker, the filthy condition of the interior and the cracked upper deck front window presented a terrible image for bus travel. I sat upstairs with two regular passengers who commented how busy the journey was yet we only had eight on board from Tonbridge at 1222 and only me and two others travelled the whole journey to Borough Green. We dropped one passenger off in Ightham, just before Borough Green, where it meets the Arriva route 308 from Sevenoaks via Borough Green to Gravesend at exactly the same arrival time, 1258. Luckily he made the connection, but he’d been worrying the whole journey whether he’d miss it and have an hour to wait for the next bus. Strikes me a small retiming of the 222 would make all the difference … as would a decent bus to travel on too. Suffice to say we picked no-one up along the journey nor dropped anyone off in the Shipbourne, Dunk’s Green and Plaxtol villages we passed through and being abandoned by the 404. I’d seen the build up in the trade press last summer. Another ‘on-demand’ ‘ride-sharing’ ‘app-based’ ‘innovative’ minibus service due to start running between central/north London and Luton airport from October 2018. The operation called ‘Blue Bus’ would “drop you off as near to your home as we can”. Obviously there would be an “Uber-style app … matching customers to the closest pick up point”. It sounded too good to be true to be covering all of central and north London. I bookmarked it to follow up the launch with a ride. October 2018 came and went but no news of the new service starting. I emailed Blue Bus founder and owner, Tazio Puri Negri to enquire about progress and he said he’d “keep me posted”. I heard no more until last week when a fullsome effusive four page article appeared in the same trade magazine confirming what was now called B.Bus has been up and running for a month ….. and “we already carried around 20 passengers in the first two weeks”. The article continued “at the moment the service is offered 7am till 5.30pm and is only available between Luton Airport and central and north London …. the long term strategy is to cover all the major airports of London. Gatwick is planned as our second expansion. There are even plans for airports to be served outside of the UK, but currently the Luton operation is where the focus for the time being will remain”. Just as well. Unable to resist trying out anything new (and innovative) I downloaded the prerequisite B.Bus app, registered as a customer, and made my plans. I must have missed the bit when it said pick ups/set downs are initially only in the Paddington and Bayswater area, and it could well be my personal technical limitations at how to use apps but I found I could only default to having Luton Airport as the origin rather than destination for my journey. Undeterred I headed off to Luton airport today to give B.Bus a try for a central London bound journey. I’m sure it was something I’d not ticked or perhaps unwittingly opted out of, but arriving at the airport, my app wouldn’t accept any destination I entered despite using the inbuilt map or typing its name in manually. It got as far as telling me Paddington was a 3 minute walk away from Paddington Station but that’s as far as I got. I decided to try the nuclear option of deleting the app and starting again. Trouble was the App Store wanted Wi-fi and I found my phone fighting between the various Wi-fi offers from National Express, Green Line and Arriva vehicles arriving and departing in the coach station – all of which need logging into or getting their own back by blocking Internet access. Increasingly frustrated I took refuge in the Terminal building and used their Wi-fi. App successfully downloaded again and having logged back in as an already registered customer, I impressed myself with finally successfully booking and paying for a journey to Paddington and very impressively being advised a bus would be with me within 10 minutes. All I needed to do was take a 9 minute walk to the drop off/pick up point for cars and non scheduled coaches as B.Bus doesn’t come into Luton Airport’s coach station right in front of the Terminal building. I’d looked on the app on my way to the Airport at likely waiting times and saw what looked like an hourly service so was well chuffed to have dropped lucky at just a ten minute wait. I received a confirmatory text at 1306 that my journey was booked and scurried off to try and find the rendezvous point in ‘Drop Off zone area Bay F’ ready for a 1316 departure. This was impressive stuff. Once I’d worked out which way to walk it only took about five minutes and although the Bay letters are marked and positioned for the convenience of drivers and hidden from approaching passengers (other than Bay O) I eventually found Bay F and waited. By 1330, fifteen minutes after my driver Simon had been due, I began to have that nagging feeling this wasn’t going to work out well. By 1345 I was on the point of giving up. The problem being there’s no contact details in the app and replying to the confirmation text just brought back ‘message not delivered’. Luckily a bus industry insider had the mobile phone number of B.Bus owner Tazio Puri Negri so I gave him a ring to find out what was happening. A colleague answered and said he’d look into it and call me back within five minutes. Which he did. Simon would be with me in twenty minutes and I’d be refunded my £7.99 fare. Sincere apologies were given with Simon’s non appearance put down to a software glitch which had shown no bookings for the afternoon. Simon duly arrived with me at 1430 and I was finally on my way. We had a nice chat as we drove down the M1 and encountered only a short stretch of slow moving traffic near the M25 delaying progress and some minor delays on the Finchley Road. Simon explained he’d got seriously delayed on the way up to the Airport by a crash on the M1 and also apologised for keeping me waiting as I boarded. I explained that I understood there’d been a software problem and he acknowledged he hadn’t received details of my booked journey. The Iveco minibus is comfortable and its nineteen seats give good leg room. A usb socket is available in the side panels. There is Wi-fi but my phone didn’t seem to pick it up. Three of the minibuses are natural gas (CNG) powered necessitating a special trip to fuel up in London while the fleet has another similar three diesel powered Iveco Daily Tourys vehicles. As we approached the end of the M1 Simon explained he was getting tight on drivers’ hours as he had to get back and fuel up before finishing his duty so we mutually agreed it would suit us both if I bailed out at Finchley Road and I’d jump on the Jubilee line and Simon could head back north before the homebound rush hour hit the M1. It had taken 50 minutes to reach Finchley Road from Luton Airport and we bid our farewells. Tazio and his B.Bus team are joining a highly competitive central London to Luton Airport market. Who can forget the legal battles between Arriva’s Green Line and National Express over the airport coach station access a few years ago. No wonder B.Bus is banished to the outer fringe of the airport although that presumably means a nice saving on departure charges. The £7.99 fare is a bargain; setting aside software glitches, if I was a regular passenger needing to get to the Paddington area and was able to easily master the app and could summon up a comfortable luxury looking minibus to arrive within ten minutes, that’s a very attractive proposition at a great deal. When I travelled on Arriva’s Green Line 757 last September it cost £11 one way to Victoria. On the strength of today’s experience though, it’s going to be a monumental task to make it a commercial success. Sure there are lots of hotels in the Paddington/Bayswater area and no doubt a percentage of their visitors pass through Luton Airport but I’m not convinced that market is big enough to sustain six minibuses. As ever promotion and getting the service known in the marketplace is a Himalayan mountain to climb, and very costly too. It’s early days but I couldn’t see a social media presence (certainly the link from the app doesn’t work) and I can’t find a website by Googling ‘B.Bus Luton Airport’ or anything similar. Apps are the current fashion but why not run a scheduled hourly shuttle on fixed times between Paddington and Luton Airport – at least we’d all know what to expect and when to expect it rather than the lottery of whether a minibus is around and can be with me “within minutes”. It might be today’s software glitch but when I tried to rebook my journey the app was telling me “There are no buses available at this moment please try scheduling a ride”. That’s not much good if I’ve just stepped off the plane especially when trying to schedule a ride, the app could only offer me a journey tomorrow morning after 0730. It’s always good to see new services being tried and I wish Team Tazio good luck; I think they’ll need it. I wouldn’t worry too much about those expansion plans for Gatwick and other airports just yet though and definitely and urgently get today’s software glitch sorted. It began a month ago. A day out to Norwich to travel route 88 via Bungay and Halesworth to Southwold, where I’d catch the four-journey-a-day tendered route 90 which returns to Halesworth via a very circuitous route through some delightful Suffolk villages as well as the small town of Beccles. Both routes were formerly operated by Anglian Bus until the more recent decision by owners Go-Ahead to phase out that company name and brand in favour of neighbouring Konectbus. News had come that Konectbus had given notice to withdraw the 88 from 1st March following a resurgent First Bus competing on the route between Norwich and Bungay and “sustained losses of several million pounds on our Beccles based operations in the last few years”. Evening and Sunday journeys are tendered by Norfolk County Council with the section of route between Halesworth and Southwold on the 88, as well as the entire 90, being Suffolk tenders so these needed longer notice periods and are continuing until the end of this month (the tendered bit of route 88) or Easter (route 90). Intrigued by all this I headed off to Norwich to investigate. In the event things didn’t work out as planned. The journey I planned to catch on the 88 at 1205 from Norwich was cancelled at short notice due to staff sickness meaning an hours delay and a missed connection in Southwold to the infrequent route 90. I quickly abandoned the idea of reaching Southwold, took the next 88 as far as Halesworth, and returned home by train from there. The enforced delay in Norwich gave me a chance to assess how Konectbus (and the former Anglian Bus) are doing some years on from Go-Ahead’s acquisitions in March 2010 and April 2012 respectively and inspired me to make plans for a longer return visit to further investigate bus operations in this part of East Anglia, which I was able to achieve this week. This blog summarises my findings. 1. What are Go-Ahead doing in East Anglia anyway? It’s not surprising the wheels are coming off. The post deregulation history of PLC transport groups in East Anglia is not encouraging. First Bus have struggled for years throughout the region. Their Essex operations are down-at-heel befitting the struggling finances. Norwich based operations are looking better than for many a year (and amazingly now seeing off Go-Ahead on the 88) but they gave up on large parts of Suffolk and Norfolk years ago. Stagecoach tried its hand and failed spectacularly with Norfolk Green. When the talk was a possible sale of municipally owned Ipswich Buses in the early 2010s it may have made sense for Go-Ahead to buy up a few small independents to build a presence in the region in preparation for a bid. A decade on it makes no sense to be running low margin tendered work at all. To be running substantial loss making operations in a largely rural area remote from other Go-Ahead operations is a complete nonsense. What’s more, the image doesn’t look good either. On the positive side the Travel Centre in Norwich bus station, staffed by Konectbus, looks smart and offers an impressive display of timetables covering all bus operators in the city, as does the Norwich Park and Ride operation but the state of the Company’s vehicles on other routes is anything but smart and leaves much to be desired. With one exception shown above (indicating the bus wash must have been working), buses were filthy and unattractive. Some were still in Bluestar livery which must look odd to passengers unaware of that award winning sister Go-Ahead company on the south coast. The image portrayed reminded me of a down-at-heel small time bus operator on the verge of going out of business rather than a subsidiary of a well regarded aspirational multi national transport group quoted on the stock market proud of its reputation. Shareholders wouldn’t be proud of this image nor should management. My next departure at 1305 on the 88 on my aborted day trip unimpressively left late because the driver failed to turn up on time meaning passengers experienced well over an hour to wait and of course there was a double load to load too, and for a route in its last couple of weeks operation was actually quite a decent load. Down in north Essex and south Suffolk Go-ahead owned Hedingham and Chambers (also both acquired in the 2012 Anglian buying spree) present a smarter image but there are odd inconsistencies in corporate livery. Despite my keen interest in these things I was confused what each brand/company was supposed to look like or whether they were supposed to look the same; goodness knows what passengers and potential passengers think. It’s a complete muddle. The Chambers operated 753/754 trunk route between Colchester, Sudbury and Bury St Edmunds seems well run as does the Hedingham run 88 (yes, another 88) between Colchester and Halstead (in a long standing joint operation with First Bus – from the days of Eastern Counties and Hedingham working together) and route 89 between Halstead and Braintree all of which I sampled, but these routes will never be double digit profit margin bankers for a PLC. My advice to Go-Ahead is to get First Bus to agree a couple of hundred grand off the price of Manchester Queens Road and throw this lot in as part of a transfer deal. It would make for a sensible ‘Withdrawal Deal’ for Go-Ahead in Anglia. Another exit strategy would ironically be to sell the former independently operated routes back to, err, an independent operator (see below). I mentioned above that First Bus seem to have got their act together in Norwich now looking smarter and presentable. The high profile excel ‘X1’ route at one time from Peterborough to Lowestoft, now split into manageable sections, still brings quality looking buses into Great Yarmouth and Lowestoft. While at one time Anglian Bus seemed to be running rings around First Bus on the Norwich, Beccles, Lowestoft corridor nowadays First’s X2 (fast) and X22 (via Loddon) provide four buses an hour (two on each route) making for a decent service which seemed well used on my travels. Lowestoft has always seemed to be low down the First Bus priority list whenever I’ve visited and this time was no exception. The hourly route 99 down to Kessingland and Southwold was characteristically operated by ‘W’ registration double deckers dating from 2000 giving a travel experience befitting of the east coast resort’s dated image. The bespoke livery variation used in Ipswich looks smarter than plain First Bus colours, if a bit dull, but with seat backs also branded for these operations I fail to understand the logic of where local branding fits into the First Bus strategy. There was a time Corporate HQ told us it was essential to have a nationwide corporate livery so that buses could easily and cost effectively be transferred around the country as needed (in addition to satisfying Aberdeen’s corporate ego). So what’s with the bespoke seats then? It would be so much better if those Aberdeen control freaks just empowered managing directors to reintroduce proper local branding and really show what could be achieved in tune with the Anglian market. Sadly First Bus still leave a lot to be desired when it comes to detail. I wasn’t impressed catching the early morning 0615 departure on route 64 from Ipswich to Aldeburgh after initially being reassured to find the bus already screened up and waiting on stand soon after 0600 only to find the driver saunter up to the bus at 0622 and load the six of us boarding, one of whom told me it happens every day. We finally left ten minutes late at 0625 but by Woodbridge were already ahead of scheduled time so waited four minutes there, a further five minute wait at Wickham Market and finally arrived Southwold two minutes early. You can easily take twenty minutes out of the scheduled time for that journey and stop regular passengers having to wait on a cold windy morning for the bus doors to open at the bus station. I tweeted this experience to First’s centralised tweeting operation; obviously didn’t receive any reply or apology, not even an acknowledgement. Frankly a contemptuous way to treat passengers. The general impression of buses around Colchester is poor. Neither First Bus or Arriva’s presence in the town is particularly dynamic and enticing. The bright spot is the First Bus run Travel Centre located fairly close to the main departure bus stops in Osborne Street. It contains an impressive display of timetable leaflets and even a network route map displayed on the wall (albeit requiring a minor updating, but at least this was admitted by way of a piece of paper stick to it). What would really be helpful for passengers is timetables for routes run by other operators to also be displayed. I didn’t visit the First Bus Travel Centre in Norwich this time, but suspect the same policy holds good there too. It wouldn’t cost anything and would do a huge amount to promote public transport use overall, instead of making it so hard for passengers to obtain information. First Bus are stepping in to cover the withdrawal of the tendered part of Konectbus 88 by extending their Lowestoft to Southwold route 99 (to be numbered 99A) on to Halesworth and Bungay where there will be connections to their commercial route to Norwich. The wheel really has turned full circle here with First Bus, or Eastern Counties, as it was, now regaining territory ceded to Anglian Bus, acquired by Go-Ahead and now throwing in the towel. Talking of Anglian Bus…. East Anglia is fortunate in having a good selection of quality independently owned small bus companies providing key routes across the region. From the expanding Stephensons in the south of the region to Sanders Coaches in the north and many more in the middle. Julian Paterson, formerly of Konectbus now owns and runs the excellent Lynx in West Norfolk while Andrew Pursey formerly of Anglian Bus has started and runs Border Bus. I travelled on two of their three routes during my visit this week, the tendered four-journey-a day 521 between Aldburgh and Halesworth and the hourly (with extra morning journeys making for half hourly) 146 running fast between Norwich and Beccles where it competes with the already mentioned First Bus operated X2 and X22. It then continues to Carlton Coalville and Kessingland on the outskirts of Lowestoft before terminating in Southwold. The lunch time journey I travelled on out of Norwich had a good seated load of twenty with around a third getting off in Beccles, half in Kessingland and just a smattering travelling all the way to Southwold. The 521 was less busy. In fact it was dire, which brings me to…. I spent most of my time this week exploring Suffolk as well as in northern Essex with only shorter incursions into Norfolk. Suffolk is a delightfuly county but with many transport challenges not least the very low density of population. Aside from Ipswich and Lowestoft and their environs, and the smaller market towns of Beccles, Bungay, Bury St Edmunds, Halesworth, Saxmundham, Stowmarket, Sudbury and Wickham Market, away from the coastal communities of Aldeburgh and Southwold the county is characterised by hundreds of tiny hamlets connected only by circuitous narrow country roads. The rural transport challenge for the county is therefore huge, not helped by Suffolk deciding to save 20% of its £1.7million budget from April. I read about discontentment with proposals to withdraw some off peak journeys on routes 112/113 which run from Diss (just over the border in Norfolk) to Ipswich operated by Galloway Travel Group (who run extensive coach tours and excursions as well as some local bus routes). Apparently off peak journeys are at risk but I travelled on one of the few peak hour journeys leaving Diss at 1655 and arriving Ipswich at 1808. A deadly quiet Diss bus station is pictured above at 1645 approaching the evening peak. Three passengers boarded with me at Diss all travelling to the village of Eye just thirteen minutes south. For the next hour and four minutes until we reached Ipswich it was just me and the driver. It’s not cuts to rural bus routes leaving passengers isolated, its passengers deserting buses leaving the buses isolated and running empty. My journey on the Border Bus operated tendered route 521 at 0855 from Aldeburgh to Halesworth was similarly sparsely loaded. We travelled empty all the way to the hamlet of Benhall Green where at 0929 we picked up four passengers and dropped them off five minutes later in Saxmundham picking a Mum and child up there and dropped her off seven minutes later in Yoxford. The rest of the journey taking around an hour was just me and the driver. The journey on the Konectbus 88 (soon to be a First Bus 99A) between Halesworth and Southwold at 1023 had just two passengers on board while the afternoon peak journey on route 90 leaving Southwold at 1638 travelled all the way to Halesworth via Beccles (a journey of 1 hour and 17 minutes) carried just two other passengers besides me and the driver and then only between the hamlet of Willingham and Beccles – a journey of around ten minutes. Border Bus have announced they’ll be stepping in to run partial replacements for the withdrawn 90 with new services 522 and 524 but with paucity of numbers travelling it’s a bleak future. Unsurprisingly a significant role is played by community transport in this region. It’s interesting to see up in West Norfolk one of the beneficiaries of the Stagecoach pull out in Kings Lynn has been West Norfolk Community Transport (WNCT) who’ve expanded their ‘Go to town’ branded bus routes, which now provide a significant part of the town’s bus network. It’s also interesting to see Ben Colson who owned and ran Norfolk Green heavily involved in WNCT who, with the already mentioned Julian Paterson and Andrew Pursey are three key people in making the Anglian bus scene a success. It also shows you can’t keep a good busman down; they just pop up in another exciting bus venture. Indeed Andrew also volunteers on the Committee of the Beccles and Bungay Community Transport who I had the pleasure of spending the whole of yesterday morning with travelling around their Wednesday only three rural bus routes between Halesworth and Beccles, all using the number 532. I’d been recommended to travel on the routes by blogger Steve’s Bus & Train Page on Twitter (@busandtrainpage) and how right he was to encourage me to give them a try. I also found out another Twitter stalwart Tim Miller (@banditman59uk) is a relief driver for the route when regular Mick has a day off. Driver Mick is a real gem. His knowledge of Suffolk is impressively huge. Being a local lad he regaled me with fascinating insights and information about the area as we travelled around. The Wednesday only route 532 really is a ‘lifeline bus service’. Yesterday around a dozen people travelled on the first journey from Laxfield, Heveningham and Huntingfield north into Halesworth for a morning’s shopping and other commitments. Two stayed on the bus for the next journey which runs via Brampton, Willingham, Sotterley, Wrentham, Rushmere and Mutford to Beccles which I joined. A lovely couple boarded along this part of the route with the husband helping Mick out to provide a commentary by adding historical background to the sights we passed – which were mainly churches – an amazing number too – all told, we passed 21 churches yesterday morning, some with just a few houses nearby. The one pictured below, a paticularly fine example, at the end of the route in Laxfield. As you can see, even the cars park in a colour coordinated way, the village is so pretty! After dropping our four shoppers off in Beccles from that trip it was time for Mick’s third run of the day back to Halesworth via even more tiny micro hamlets and churches (and the odd water tower) including Ilketshall St Andrew, Ilketshall St Margaret, St Peter South Elmham, All Saints South Elmham (you get the idea this used to be a very religously devout area!) and finally Rumburgh and Wissett; we picked up four regulars along the way who all had an hour and twenty minutes in Halesworth before return time, while we continued back to Laxfield to take ten passengers back home who’d come in on the first journey, bringing one regular back into Halesworth on the return. Mick was off back to Beccles via the All Saints route but I left him there having completed the full circuit and having thoroughly enjoyed it too. One of the regulars who boarded in Wissett followed me into the library at Halesworth to find out more about why on earth someone from Brighton was riding around Suffolk’s rural countryside and we got chatting about the problems of rural buses and her concerns at being stranded if Suffolk County Council were to cut this vital once a week route. Apparently it’s up for review soon as the conract ends in the summer. Encouragingly this minibus had carried the most passengers of all the tendered bus routes I’d travelled on during the last few days and I do hope her fears can be allayed. Suffolk County Council should be well pleased with the support the ‘BACT’ community transport receives from passengers as well as the great personal service Mick provides. Long may it continue. It’s a good example of how buses can continue to provide deep rural transport without the need to come up with new fangled ideas like app based DRT – just fund and run a scheduled low cost once or twice a week community minibus. Sorted. Indeed the town route 511 in Halesworth is also operated by Community buses, this one by the locally based Halesworth Community Transport. Firstly Suffolk County Council are reportedly considering saving £100,000 by ceasing to update and post bus stop timetables and information. This would be a huge mistake. Such information is vitally reassuring particularly for strangers like me to an area. Suffolk’s presentation is excellent – don’t change it. Secondly there’s a vital need for East Anglia to follow Kent/Surrey/Sussex’s lead in establishing an all bus operator day ticket like the latter’s Discovery ticket. With a variety of small bus companies and a few larger ones (Ipswich Buses, First Bus and Arriva) it really would make for a passenger friendly way of travelling around rather than having restricted ticket availability to each operator. You need every passenger you can get – don’t make it hard. Perhaps Suffolk County Coiuncil could initiate discussions on such a proposal? It’s always a pleasure to visit the Garden of England. My journeys on two days last week included visits to both ends of Kent – to Dover and Deal on the Channel coast in the south east and to Sevenoaks close to the County’s western border with Greater London. Both Stagecoach South East and Go-Coach Hire, the dominant bus companies in these two areas, are excellent bus operators for the following reasons…..
Stagecoach’s attractive bus network in Kent is an excellent example offering comprehensive coverage for passengers as well as ‘behind-the-scenes’ operating efficiency for the company. It includes well used inter-urban links between main urban areas at good frequencies despite some recent reductions (and competition from Southeastern trains), as well as small bespoke town networks and a few great rural routes, some operated by double deck buses due to school peak requirements, which offer fantastic views across the Kent countryside. Notable among these are the 11 (five journeys Canterbury – Westwood and Broadstairs via the delightfully named Plucks Gutter with its timing point The Dog & Duck), and 17 (hourly Folkestone – Canterbury via the lovely Elham Valley). There’s also the 18 (five journeys Canterbury – Hythe via Wheelbarrow Town) but this is scheduled for single decks. Still a great route though. Stagecoach South East also craftily link one route with another to provide helpful ‘cross-terminal’ journey opportunities. Southeastern Trains also do this with the rail network such you can get on a High Speed Train at St Pancras and travel via Ashford and Folkestone to Dover round to Deal and Sandwich where the train continues on to Ramsgate and Margate and back via Faversham to St Pancras where it arrives after a 3 hour and 33 minute round trip. Stagecoach run a ‘circular route’ called the Triangle from Canterbury to Whitstable and Herne Bay which is marketed as Triangle in addition to linking routes 4 and 6 which run similarly between Canterbury and Herne Bay via two different routes and where they link up to also provide a circular ‘triangle’. Another good example of timetabled through working providing great travel opportunities are the routes I travelled on last Friday – the 80 and 81 which run two buses an hour between Dover and Deal (via slightly different routes – but both giving great views of Dover and its castle) and on to Sandwich (via Hacklinge or Eastry) where they turn into a 43 and continue westwards to Canterbury. Between Sandwich and Canterbury the 43 runs at an attractive twenty minute frequency with the extra bus an hour commencing in Ramsgate to provide a Ramsgate, Sandwich Canterbury service. It all fits together very nicely, and Sandwich is well worth a visit. And best of all Stagecoach South East must be commended for their excellent colour coordinated marketing and publicity for these and the other bus routes they run throughout Kent. It really is a treat to find a colourful network map together with individual leaflets (almost as good as a book!) each with an individual clear map of the route in a geographic context and, where appropriate an extract from the network map to show other routes in the area. They really are exemplars of good timetable leaflet practice. I also spotted the network map on display in major points such as Dover’s Pencester Road (albeit inside the now rather worn information office) and at Canterbury in a display case on the bus station’s concourse alongside the travel office with its display of timetables and other tourist leaflets inside. And the icing on the cake is the colour coding follows through to large easy-to-see bus stop numbers on virtually every bus stop flag. They really were impressive to see and showed a level of attention to detail and excellent intent to provide clear information. Bus stop timetable displays are also easy to follow and understand and appeared at every stop. It’s so refreshing to see such excellent clear information and just goes to show it can be done. As is the case around fifty miles over at the western end of the county in Sevenoaks. Here it’s interesting to see Go-Coach Hire Ltd go from strength to strength as they move from being a small time tender operator when they first began in the bus market just over ten years ago to now taking over from Arriva Kent as the network operator in this area. On previous visits to Sevenoaks I’ve been impressed with how Go-Coach have taken over the town’s bus station and proudly emblazoned their bright yellow and purple branding to brighten up what would otherwise be a rather dull wind tunnel of two departure bays. There’s a small travel office with an amazingly friendly and helpful member of staff and an excellent full display of timetable leaflets including those services operated by Arriva thereby providing a much welcome comprehensive coverage of routes operated in the area. I was particularly impressed to see that the out-of-date no-longer-issued maps from Kent County Council which used to be on display in the bus station on previous visits have been replaced by up to date maps of Go-Coach’s network. I spotted them on bus shelters elsewhere in the town too. The bus stop plates also feature both Arriva and Go-Coach’s serves and all clearly presented to appropriate corporate style. Interestingly from early next month Arriva Kent are throwing in the towel on local routes 1 and 2 from Sevenoaks to Dunton Green and Kemsing. They’re the routes Arriva converted to the horribly cramped Mercedes Sprinter minibuses a year ago. I had a ride in the first week and knew within a few minutes it would be a complete failure. Completely unsuitable for the market and what a shame passenger numbers have obviously plummeted in response to such unattractive vehicles. On Wednesday when I visited larger buses had already supplanted the minibuses on route 2. Go-Coach are taking over these routes as part of their expanding network and I hope their local connections and attention to detail in getting things right for passengers will attract enough passengers back to the routes to make it a commercial success for them. It’s interesting, nearly fifty years on from London Country Bus Services being formed in 1970 just how many bus companies now operate in what was the polo mint around London, and increasingly successfully too, after some traumatic times after deregulation and privatisation in the late 1980s. Metrobus in Crawley and Ensignbus in Grays come to mind as top class acts, but Go-Coach are making great strides to make this corner of Kent a great exemplar of how a small network operator can succeed. Sadly, they often say, a bus company’s reputation is only as good as the last journey taken and my attempted journey with Go-Coach didn’t quite work out as planned on Wednesday; but company boss Austin Blackburn was on the case straight away as soon as he saw my tweet and made sure appropriate action was taken and apologies made – and that was impressive and just showed a caring owner giving attention to detail, which is what it’s all about. I’m already looking forward to a return trip and hopefully next time be successful in catching the Wednesday only tendered rural route 405 to West Kingsdown before it ends very soon! PS I spotted the information about Arriva Kent giving up routes 1 and 2 on their website and commendably they refer to the replacements being operated by Go-Coach Hire but a slip of the year shows the date in the headline as 2018 rather than 2019. It seems even when this is pointed out by tweet to Arriva last Wednesday, it still isn’t corrected on their website today. Attention to detail and reacting to feedback and all that…not!